REGROUPING after an international break is easy when you’re part of what has recently been the Scottish Premiership’s meanest defence. One by one, defenders fall into place on Riccarton’s training pitches as Hearts’ back four is drilled relentlessly ahead of Saturday’s match with Dundee. They recorded four successive league clean sheets before national-team fortnight and plan to remain just as impervious when league business resumes tomorrow. Blazej Augustyn, the cultured Pole, has formed a watertight partnership with Brazilian Igor Rossi in central defence, with Callum Paterson and Jordan McGhee at full-back. The absence of captain Alim Ozturk through injury has barely had any negative impact, while Nigeria’s World Cup left-back Juwon Oshaniwa is not guaranteed a starting place. Training-ground drills have shaped Hearts’ back line into a formidable unit full of physique, awareness and intelligence. It’s a stark contrast from those early-season days of shipping three goals at home to St Johnstone, another three at Hamilton, plus two at Inverness. The multi-cultured defence is coming together. Augustyn, Rossi and Oshaniwa only arrived in the summer and are now in tune with the demands of Scottish football. Communication is the catalyst for the improvement. Every instruction is in English, whether it is your mother tongue or a language you have yet to fully master – as is the case for Rossi. “In defence, you only need to know a few words,” says Augustyn. “When it’s my ball, it’s my ball. When it comes into my area, I know already it’s mine. Maybe you shout a name. Most of the words are ‘left’, ‘right’, ‘squeeze’, ‘drop’. Igor knows the words and he knows when to it. “We do everything at the same time and that’s most important for centre-backs. When you have to squeeze, you do it together to leave a striker offside. I can’t say ‘squeeze’ and I squeeze by myself and Igor is back there [he points behind]. “Everything is in English. Igor has learned the words by himself. He speaks Spanish and I understand some Spanish. I speak Italian but on the pitch I have to speak English for everybody. When I shout “squeeze”, it’s not only for the defence. The centre-midfield have to move up as well and take up their positions. Augustyn’s linguistic talents become even more impressive when he reveals he doesn’t even use his native tongue at home. Instead, he talks in Italian. He certainly enjoys a challenge. He prefers to do his talking on the pitch. Keeping Dundee out tomorrow is the priority for the 27-year-old as second-placed Hearts try to keep pace with league leaders Celtic. “We have to keep that record but we know it will be hard to do this every single game,” says Augustyn. “That’s normal. We understand everything better and we are fighting for each other, that’s why we are getting results. It’s normal that you need time to get to know the game in each country. We are getting better so we have to be pleased with that. 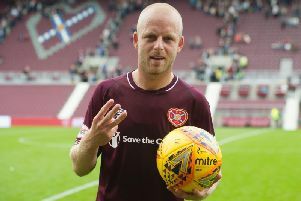 Having played in Italy’s Serie A and Poland’s Ekstraklasa, Augustyn is enjoying life in Scotland after signing a one-year deal at Tynecastle in July. “Scottish football is similar to Polish football. In Poland, they play a hard game and they fight a lot. There are a lot of one-v-ones, it’s physical and defenders have to fight against an opponent. In Italy, it’s more like a game of chess. Everyone works together. It’s not like here, where everyone fights in the air or things like that. It’s more technical, there is more passing and more tactics. “Scotland is similar to Poland and I like it here. When you are in Italy and you are playing, it’s okay. When you don’t play and you are watching, it’s boring. Football is open here and it’s always nice to watch. “I don’t know if it’s a surprise or not that Hearts are second but we are working hard. Our coach [Robbie Neilson] knows the football and the players in Scotland and he always says that we are a good technically, good physically and good tactically. “It’s not that we don’t have to worry about other teams, but we have to be sure of ourselves and be confident that we can fight with anybody here. With Augustyn marshalling a rigid defence, Hearts have every chance of proving him right.